I recently added this kitten teapot to our collection in the new tearoom. I kept it in my dining room before that because it was the first thing I bought when I went to Paris 16 years ago. It was charming in a particularly unique way that felt like I was definitely not in America any more. One thing I learned those first few days in Paris was how different it was to shop in their perfectly curated stores that lined the streets. On the morning we had arrived, I couldn’t wait to run down to the shop that was below our hotel. I picked up a box of strawberries from a beautiful display at the entrance. The proprietor looked at me as if I had told him I had accidentally wrecked his car in the parking lot, shook his head in disbelief and eventually put the berries in a bag in disgust as I handed him money for my purchase. I ran back up to our hotel room embarrassed and confused. My husband got our copy of Rick Steves Paris and we looked into French shopping customs, which made it clear that picking products off a display that was thoughtfully laid out by shopkeepers was a definite violation of Parisian etiquette. 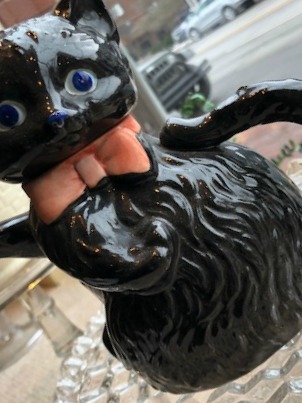 The next day, after mustering up the courage to say Bonjour as I entered a jewel of a teashop on our street, I pointed to this enchanting kitten teapot, and the polite and gently smiling shopkeeper got it down from the shelf. I paid for it and afterwards felt a little closer to the culture that I longed to discover in person as much as I had admired from afar. Paris had many lessons to teach me about beauty in every aspect of life.